ONGC Gujarat Recruitment 2019 - Apply Online for Apply Online for 737 Technical Assistant, Assistant & Other Posts in ONGC Gujarat, Gujarat on Regular Basis. 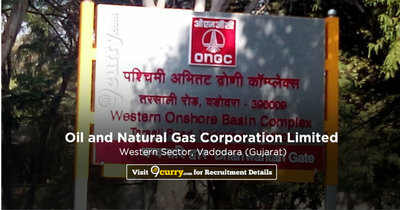 Online Applications are invited by Oil and Natural Gas Corporation Limited, Western Sector, Vadodara (Gujarat) from 31 Jan 2019 10:00 AM to 20 Feb 2019 till 06:00 PM for 737 vacancies. Pay the Registration Fee can be deposited at any branch of State Bank of India in ONGC Power Jyoti A/c. No. 30827318409 of SBI, Tel Bhavan, Dehradun through Challan Form. 19 Post Graduate Degree in Chemistry. 07 3 years Diploma in Civil Engineering. 38 3 years Diploma in Electrical Engineering. Should have Valid Certificate of Competency as Electrical Supervisor. 19 3 years Diploma in Electronics/ Telecom / E&T Engineering (or) M.Sc. in Physics with Electronics. 20 3 years Diploma in Mechanical Engineering. 02 3 years Diploma in Mechanical/ Petroleum Engineering. 132 3 years Diploma in Mechanical / Chemical / Petroleum Engineering. 24 3 years Diploma in Mechanical Engineering with Ist Class Boiler Attendant Certificate. 03 3 years Diploma in Auto/ Mech/ Post Graduate Diploma in Business Management / Administration or Post Graduate. 01 3 years Diploma in Material Management/ Inventory/ Stock Control Recognized by the State Board of Technical Education/ One Year PG Diploma in Material Management. 11 Graduate with one year Experience in Security. 12 B. Sc. with Chemistry as the main subject. 76 High School or Class X Equivalent Board Examinations with Science and Trade Certificate in Electrician Trade. Should have Valid Certificate of Competency as Electrical Supervisor. 13 High School or Class X Equivalent Board Examinations with Science and Trade Certificate in relevant Trade. 27 High School or Class X Equivalent Board Examinations with Driving License for Heavy Vehicle and 3 years driving Experience of heavy vehicles. 04 High School or Class X Equivalent Board Examinations with Driving License for Heavy Vehicle and 3 years experience in loading and unloading. 17 Diploma in Pharmacy of minimum 2 years duration and should be registered with Pharmacy Council. 01 High School or Class X Equivalent Board Examinations with Certificate of Auxiliary Nurse and Midwifery Course and should be registered with Indian / State Nursing Council. 27 B. Sc. with Physics or Maths as one of the subjects with proficiency in typing 30w.p.m. with Certificate / Diploma of minimum duration of six months in Computer applications in the office environment. 18 B.Com. with proficiency in typing 30 w.p.m. and Certificate / Diploma of minimum duration of six months in Computer Applications in the Office Environment. 29 Graduate with typing speed 30 w.p.m. Certificate/Diploma of minimum duration of six months in Computer Applications in the office environment. 01 Graduate with typing speed 30 w.p.m. and Shorthand at 80 w.p.m. Certificate/Diploma of minimum duration of six months in Computer Applications in the office environment. 01 Graduate in Hindi with English as one of the subjects. Typing Speed 30 w.p.m. in Hindi to be conducted on Computer and Certificate / Diploma of minimum duration of Six months in Computer Applications in the Office Environment. 20 Intermediate with 6 months training/experience in security. 13 Intermediate with 6 months experience in Fire services. Driving Licence for Heavy Vehicles essential. 05 High School or Class X equivalent Board Examinations with Fireman’s training of Three month’s duration. Valid Driving Licence for Heavy Vehicle essential Driving Test on Fire Tender /Heavy Vehicle applicable. 03 Matriculation with First Aid Certificate. Eligible candidates may apply online at ONGC Gujarat 's website (direct link is given below) from 31 Jan 2019 at 10:00 AM to 20 Feb 2019 till 06:00 PM.